"Futurecop" redirects here. For the electronic music group, see Futurecop! 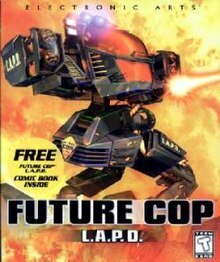 Future Cop: LAPD is a third-person shooter developed by EA Redwood Shores and published by Electronic Arts and released first for the PlayStation, then Mac OS and Microsoft Windows. Future Cop was originally developed as an installment of the Strike series. There are two modes of play in the game, Crime War and Precinct Assault (both modes can be played either as single player or two player). Precinct Assault is a strategy mode that is similar to Herzog Zwei (except the player can actively help his armies get to the other base) and is well known for inspiring MOBA games like DotA and League of Legends. Crime War is a story mode, following a day in the life of an LAPD X1-Alpha pilot. The story events range from rogue lunatics arming observatories with weapons, to a malfunctioning supercomputer. Players begin in a futuristic Griffith Park, but as they advance through the game they may unlock areas such as Venice Beach, LAX and Long Beach. Crime War also supports a second player in cooperative play. Cooperative play features the unique feature that the life bars of the two players are intertwined; if either player is destroyed, it counts as a failure for both players. Cited as an early MOBA game, Precinct Assault is an arena battle mode in which each player starts with a single base and can capture automated Turrets or Outposts across the map. The objective is to defeat your opponent by purchasing and deploying Hovertanks to invade their main base. The game ends when one player's base is breached by either a standard or super-sized "Dreadnought" Hovertank. Players may also deploy defensive Helicopters or the "Flying Fortress" Superplane to assist in securing their perimeter, shooting down enemy tanks that come near the base. Single-player mode consists of fighting a computer opponent named "Sky Captain", whose in-game avatar is a Superplane, more powerful and advanced than the X1-Alpha. Two player mode is a competitive battle between two X1-Alpha robots. There are five different precinct assault areas with 10 difficulty settings (for single player); however the level "La Cantina" was not on the original PlayStation release, only being added later for the computer versions. There is also a bonus area, known as 'Bug Hunt', which is the same as the 'Proving Ground' level, except all objects have been made into creatures such as worms and butterflies, instead of Hovertanks and Helicopters. The Flying Fortress is now a bat, and the Dreadnought is a large, armored caterpillar. The level features an up-beat music track in comparison to the game's normal dark military music and "Sky Captain" is a dragonfly. The PC version also allowed for online competitive play, technically making Future Cop: LAPD the first MOBA game ever released. The game reportedly sold only 200,000 units, after which members of the studio split and moved to other studios. On review aggregator site GameRankings Future Cop: L.A.P.D. has an aggregate score of 80% on PC based upon 2 reviews and an aggregate score of 79% on PlayStation based upon 8 reviews. Despite its poor sales, the game received generally positive reviews. IGN gave the PS1 version an 8.3, while saying "The whole package is there. Great sound effects, good single-player action, tons of non-stop shooting, lots of great weapons, massive explosions, and a super two-player mode." GameSpot gave the game a 7 out of 10, while saying "Future Cop is a good game. Returning to the beginning of the level after dying really hampers the main game, but the other mode is really outstanding. Definitely worth checking out." ^ "Future Cop: LAPD". Play Old PC Games. 2014-05-23. Retrieved 2018-12-28.